Olivia Joules, written by Helen Fielding, the author of the Bridget Jones novels, and published in 2004, is a comedy-romance-spy-thriller about a journalist who suspects a millionaire businessman may also be a terrorist. When a journalist starts to suspect that the multi-millionaire who’s courting her is also a terrorist mastermind, she turns freelance spy, braving real spies, sharks and scuba diving in a quest to discover what he’s really up to. Warning: My plot summaries contain spoilers. Major spoilers are blacked out like this [blackout]secret[/blackout]. To view them, just select/highlight them. It’s the early 2000s. Olivia Jules is a journalist for the British Sunday Times newspaper and Elan magazine. Olivia’s real name is Rachel Pixley, but she’s reinvented herself as a high-powered journalist after a normal small-town childhood. Because of her background, Olivia suffers from imposter syndrome, but lives by a set of rules to help her control her self-doubt. She also has a reputation for having an ‘overactive imagination’, being prone to intuitive leaps. Olivia is in Miami to cover the launch of a face cream when she meets Pierre Feramo, the head of the company. Olivia finds Feramo attractive, but also feels there’s something suspicious about him. While Olivia is in Miami, an enormous cruise ship docks in the harbor, and Olivia pitches a story on it to her editor. The next day, while Olivia is passing the cruise ship on the way to her breakfast rendezvous, it blows up. Olivia, who is a trained driver, helps to rescue survivors from the water, but the terrorist attack kills hundreds of the ship’s passengers. Feramo leaves Miami for Los Angeles and Olivia follows him. In LA, she meets the people Feramo has got together for his movie, but can’t believe he’s financing such an obviously terrible film and thinks it’s a cover for something else. Olivia tries to call the FBI to tell them of her suspicions about Feramo, but another call interrupts her and then she decides to leave it. Later that day, though, Elan magazine fires her for causing trouble. This makes her even more suspicious, as no one knew about the call. She has the room swept for bugs and the technician finds one – there does seem to be something more than imagination in her worries about Feramo. Feramo invites Olivia to his house in LA and though scared, she goes. At Feramo’s house, she finds a secret room but Feramo catches her snooping around. He laughs it off, and they take a helicopter to an island off the California coast. Feramo admits he is a muslim but tells Olivia he didn’t bug her and will get her reinstated at Elan. He also invites her scuba diving at a resort in Honduras. Rather than going straight to Feramo’s resort, Olivia makes her own way to the island and investigates the area. She meets and hangs out with the local divers including one called Morton, who she kisses. The divers are skirmishing with the resort over diving sites and Olivia becomes even more suspicious of Feramo after hearing rumours about his resort. While swimming she comes face to face with a mysterious diver and one of her diver friends dies. Feramo then tricks Olivia into coming to his resort. She discovers more about him, but he’s drunk, and more and more unstable and threatening. She bluffs her way out, playing on his notions of romantic honour and saying she has to return to London. Olivia Joules has a hybrid plot, primarily a Mission plot with mystery elements, but also owing a lot to the comedy-romance genre (see Spy Novel Plots). To an extent it’s comparable to other comedy-romance-thrillers like North By Northwest and Charade, although having a female protagonist changes the ambiance substantially. Helen Fielding has a quick and easy way of writing – clear and journalistic. It’s not literary writing by any stretch, but it flows along nicely, with regular touches of humour. Olivia Joules has half a dozen comic-book-style illustrations peppered throughout the text. I’m trying to think of another novel aimed at adults that I’ve read in the last few years that had illustrations. I can’t think of any. I can think of a couple with diagrams, maps and other types of false documents but none with cartoon-style illustrations. Olivia Joules, like The Gun Seller, shows how hard it is to pull off a comedy thriller. In the case of Olivia Joules it’s even harder, because it’s a comedy-romance-spy-thriller. In a cross-genre novel, as the writer switches between the scenes that are primarily comedy-romance to more serous spy-thriller scenes, it’s hard to maintain a consistent tone. 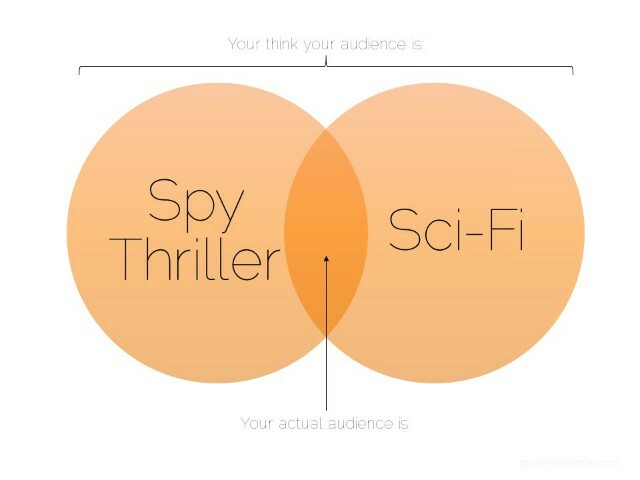 That can lead to a novel that doesn’t appeal to either audience – the comedy-romance audience don’t enjoy the spy-thriller sections and vice-versa. For example, I mostly read straight spy-thrillers and I very nearly gave up on Olivia Joules after a couple of chapters, because it just seemed so ridiculous to me. The kick-start to the plot, where Olivia, for no good reason whatsoever, decides Feramo is Osama Bin Laden in disguise seemed so unbelievably silly that I put the book down and decided not to read the rest. Obviously, I persevered, and did enjoy the novel in the end, but probably would have enjoyed it more if it’d been more spy-thriller and less comedy-romance. A lot of reviewers have also claimed that Olivia Joules is ‘James Bondish’. I can only assume they’ve never read a James Bond novel. It perhaps has a small amount in common with one of the more comedy-style Roger Moore Bond films. Olivia Joules is a light-hearted, even escapist, comedy romance – lightweight fun – for much of its length. But in the third act it lurches into a serious terrorist plot and throughout includes references to real-life terrorists (Al Qaeda and Osama Bin Laden, who was still at large at the time). Tonally, this doesn’t really work. A fun, light read. Perfect for the beach. If you’d like to discuss anything in my Olivia Joules review, please email me. Otherwise, please feel free to share it using the buttons below.